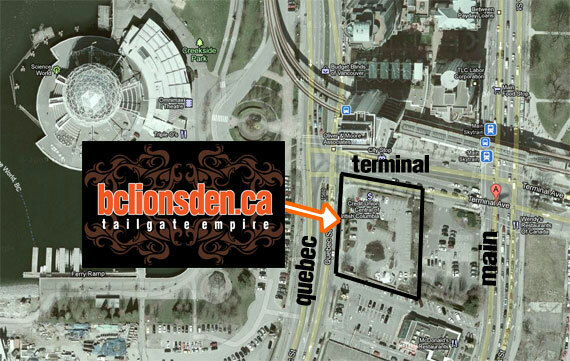 It’s always a good tailgate party when the Riders come to town! Talk to you next week everyone, 5-2 as we head into Bomber land! Tailgate Empire brings the “A” game for a prime performance at Empire Field. There comes a time in every man’s life when he looks in the mirror and decides that nothing less than his “A” game will do. For the Tailgate Empire that day was last Friday at Empire Field. Members of the Tailgate Empire put their pants on one leg at a time just like everybody else, but on this particular Friday afternoon something was different. Something smelled different and we were counting on something tasting different. The football club was 0-3, but that would not damper our spirits. There was no running game to be found in Jacques Chapdelaine’s play book, but the Tailgate Empire were prepared to run through a wall. 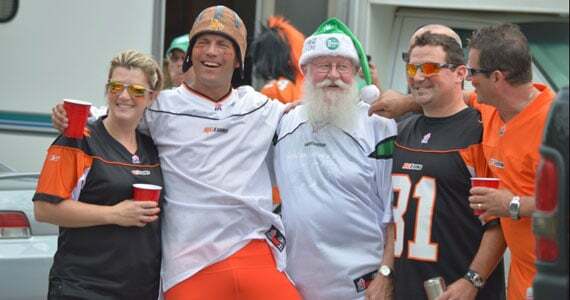 Travis Lulay’s squad were a pass happy bunch, but the Tailgate Empire were happy to merely pass the mustard. 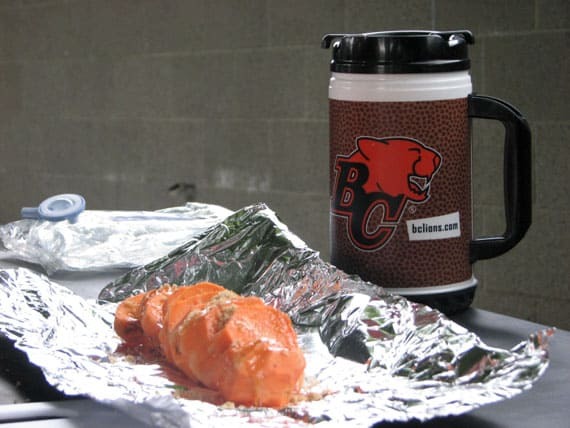 The football club was struggling, but the tailgater’s were in mid-season form. 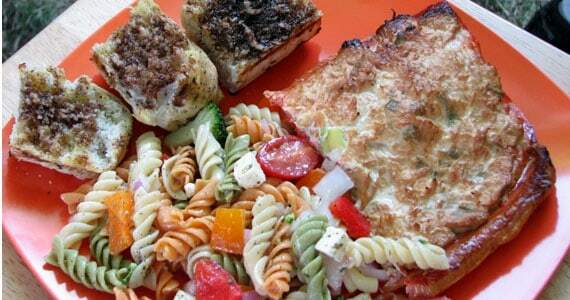 A tailgate menu is not unlike a coach’s game plan. We usually start preparing for the next game right after the last game has ended. It takes careful planning and preparation, and it will only be a success with proper execution. The menu this week was the best it has ever been. 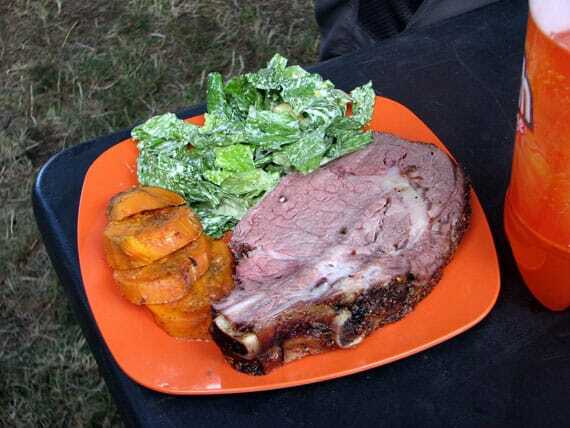 A slow cooked rotisserie Prime Rib, some Candied Yam, and a Garlic Lovers Caesar Salad. This was definitely an “Adult” tailgater. Well planned out and brilliantly executed. 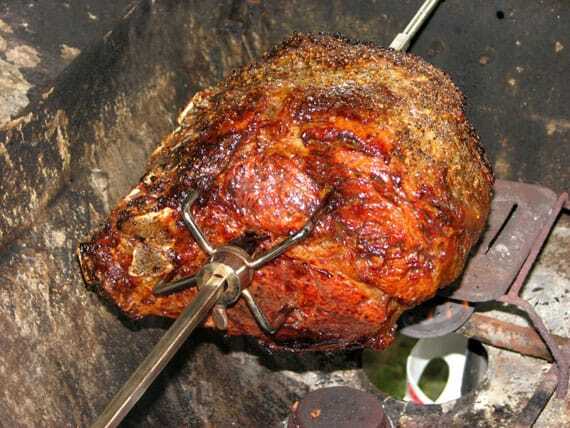 We had to bring a full size BBQ down to Empire in order rotisserie the Prime Rib. It is a little bit more work, but a small price to pay for the epic meal that was in store for us. We started with getting our smoke box loaded up with Mesquite chips. We placed the smoke box close to the flames. We found a nice central spot on the roast to run the spit through so that it spins evenly. Once that was done we salted the fat by hand with a generous portion of table salt, and then rubbed the entire roast with Montreal Steak Spice. The roast is now ready for flame. We had a three burner BBQ, so we place the roast over the middle burner and we lit the two outside burners so as to cook the roast with indirect heat. This will ensure that we cook the inside of the roast without burning the outside. We roasted it on medium for about 2 ½ to 3 hours checking occasionally. It is always best to use a meat thermometer. We wanted an internal temperature of 140-150 degrees for a nice medium to medium well Prime Rib. We usually like medium rare, but in this case we like to see the marbling in a Prime Rib cook thoroughly and inject more flavor into the meat. We pulled the roast off of the grill and tented it in foil to rest for about 10 minutes before we carved it up. The Candied Yams are a favorite of ours from way back. They are easy to do and quite enjoyable. First, peel your yam and slice them into silver dollar sized pieces. Next, position the yam pieces into a domino like row on a sheet of foil with one yam piece leaning on the next. Drizzle some honey over the yams and sprinkle some brown sugar as well. Add a dollop of butter and wrap into a foil pack. Cook on the grill with indirect heat for about 15-20 minutes and they’re ready to serve. We will spare you on the details of cutting lettuce, but we will hook you up with the only Caesar dressing recipe you’ll ever need. 3-4 cloves of garlic minced added to one egg in a tall container. Add ½ cup of vegetable oil and 2 tablespoons of olive oil while blending with a hand mixer. Once we’re all mixed in then we can fold in with a fork a dash of pepper, ½ tsp of mustard powder, tsp vinegar, tsp of lemon juice, tsp of Worcestershire sauce and ½ cup of grated parmesan cheese. Add this dressing to some romaine lettuce and croutons and your have the only Caesar you’ll ever need! We definitely brought our “A” game this time out. It was some of the best Prime Rib we’ve ever had. The best part is that we pulled this gourmet beauty off in a parking lot and then headed in to Empire Field to see another entertaining football game. Check back next week as the Roughriders are in town and Cedar Plank Salmon is on the menu. Only three games left at Empire! Related: For more photos from last Friday’s tailgate party, check out the gallery!